Joy Thibadeau, assistant to the vice chancellor for graduate education, has been named the 2016 Employee of the Year at the University of Illinois Springfield. She was honored during a reception on January 25, 2017, in the Sangamon Auditorium Lobby. 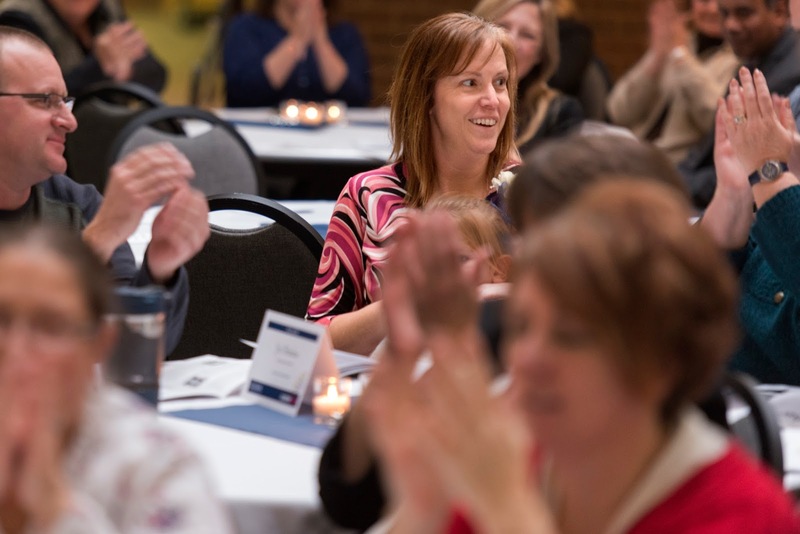 Before announcing the winner, UIS Chancellor Susan J. Koch praised the eleven Employees of the Month who were nominated. According to her nominators, Thibadeau is known for her dedication to students, faculty and staff and for going above and beyond what is expected to help them. She is also committed to improving efficiency within her office and has introduced new electronic methods to streamline processes, such as the employment application for graduate students. In her job, Thibadeau oversees the application process for graduate students applying for jobs on campus. She also is in charge of getting the UIS Catalog published online. She works with all of the academic departments to obtain course descriptions and student related data. As Employee of the Year, Thibadeau will get a check for $500, plus a special parking spot for the entire year. “Thank you all. It’s just great to work here with a great bunch of people,” said Thibadeau in accepting the award.